The Huangs will remain on dry land for another year. 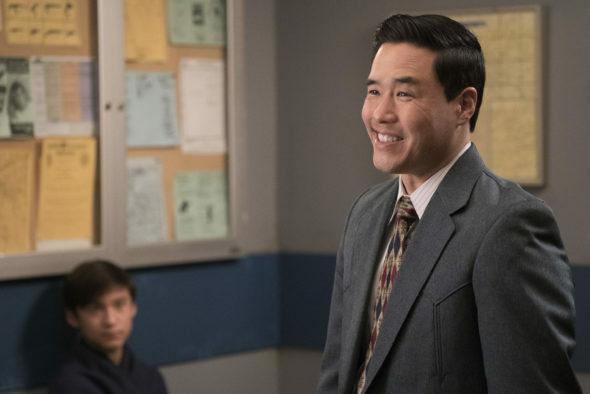 ABC has renewed its Fresh Off the Boat TV show for a fifth season. Although the family comedy has slipped some in the Nielsens, it hasn’t taken on any significant water, so the renewal makes sense. An ABC sitcom, Fresh Off the Boat stars Hudson Yang, Randall Park, Constance Wu, Forrest Wheeler, Ian Chen, Lucille Soong, Chesley Crisp, and Ray Wise. Set in the 1990s, the story centers on Eddie Huang (Yang), his parents Louis and Jessica (Park and Wu), brothers Emery (Wheeler) and Evan (Chen), and grandmother Jenny (Soong). It is loosely inspired by the early life of Chef Eddie Huang. The fourth season of Fresh Off the Boat is averaging a 1.02 rating in the 18-49 demographic and 3.831 million viewers. Compared to season three, that’s down by about 13% in the demo and 3% in viewership. It currently ranks in about the middle of the pack among scripted ABC TV shows, a few spots below Black-ish. All told, today ABC renewed four comedies: American Housewife (season three); Black-ish (season five); Fresh Off the Boat (season five); and Splitting Up Together (season two). The network also renewed three dramas: For the People (season two); How to Get Away with Murder (season five), and Grey’s spin-off Station 19 (season two). What do you think? Do you still like the Fresh Off the Boat TV series? Did you think ABC would cancel or renew it for season five? I am really looking forward to season 5 and hopefully more of Fresh off the Boat. It is a good and different comedy show…..LOVE IT!!! Love this show, PLEASE keep it going! It’s ACTUAL comedy! KEEP the seasons coming! Can’t wait until it starts up with Season 5 again. Would love to see an episode with more about grandma. Love her!